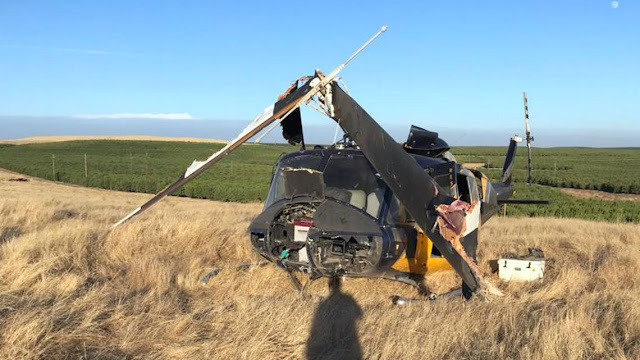 On July 24, 2018, about 1800 Pacific daylight time, a Bell UH-1H helicopter, N107CH, was substantially damaged during a precautionary landing near Oakdale, California. The pilot was not injured; the pilot-rated passenger sustained minor injuries. The helicopter was registered to Airlift Helicopters Service and operated by the pilot under the provisions of Title 14 Code of Federal Regulations Part 91. Visual meteorological conditions prevailed for the cross-country flight, and no flight plan was filed. The flight originated from Fullerton Municipal Airport Fullerton, California at 1300 and was destined for Weed Airport, Weed, California. The pilot reported that, while in a straight and level flight, he heard an unusual noise and decided to execute a precautionary landing. When the skids touched the ground, the helicopter entered an uncontrolled climb and yaw. The pilot was unable to recover from the loss of directional control and the helicopter impacted terrain. Two people were injured when a helicopter contracted with Cal Fire crashed near Oakdale Tuesday afternoon. The crash originally was reported in Tuolumne County, but the location is along Highway 108 near the Stanislaus County line. The incident occurred about 5:50 p.m.
Few details were available, but Cal Fire spokesman Scott McLean said the copter was a “CWN” - or “Call When Needed” aircraft. Cal Fire contracts with private vendors for those copters during wildfire fights. McLean said he did not have any information on the two occupants of the helicopter, other than to say both survived the crash. He also could not say where the copter was headed, but said he did not believe it was attached to the Ferguson fire near Yosemite National Park.